This book was sent to me for free. This book was sent to me by the publisher. This book was sent to me in exchange for an honest review. Synopsis: Kate Bishop thought she was an ordinary woman living and working in Chicago. But she unexpectedly finds herself in the middle of a police investigation into a brutal murder, Kate makes a shocking discovery: she has the ability to identify killers just by looking into their eyes. Trying to grasp the implications of this revelation, Kate is drawn deep into a world of terror. She is tracked down by Jack Raines, a mysterious author with shadowy connections to those who share her ability. He tells Kate that her unique vision also makes her a target, and only he can help her. Now, hot on Jack and Kate's heels are a force of super predators, vicious and bloodthirsty killers who will stop at nothing until Kate is dead. But even as she fights for her life, Kate still isn't sure if Jack is really her salvation, or another killer coming to slaughter her. 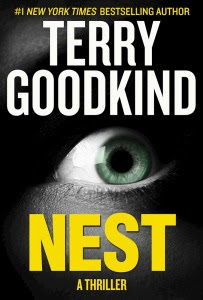 An explosive mix of action and suspense, Nest is a landmark new novel from worldwide best-selling author Terry Goodkind, and a complete reinvention of the contemporary thriller. Travel with Goodkind on a dangerous journey to the back alleys of the darknet, to the darkest corners of our minds, and to the very origins of what it is to be human. Review: Before I start the review of the book I would like to thank the publisher for sending me a copy of this book for free in exchange for an honest review. I would also like to thank the author for all the time and hard work he puts into all of his novels and how creative and imaginative his books are. Novels like this are a true work of art and you can clearly tell that the author put a lot of time and love into his creations. I am so excited to have this book in my collection. This was a truly amazing read that had me hooked from start to finish. This book was filled with plenty of action that kept me on the edge of my seat. I found it nearly impossible to stop reading and put this book down. I found myself really interested in this story line and rooted for Kate and Jack. The ending came as a real shock and i'm hoping for a second book that will tie up all the loose ends. The cliffhanger ending really shook me and after this book I found it hard to get into another book. I wondered about the ending so much that I allowed myself to slip into a reading slump. This is a book that I can see myself enjoying numerous times and it also makes me want to read more by Terry Goodkind. I would highly recommend this book to all readers but especially those that enjoy a good thriller that they can get lost in.